In a plan that could up-end both conventional grocery chains and app-based services like Instacart, Amazon is hoping to open more than 2,000 self-branded grocery stores, according to a report. Prospects are dependent on the success of test locations, sources informed The Wall Street Journal. 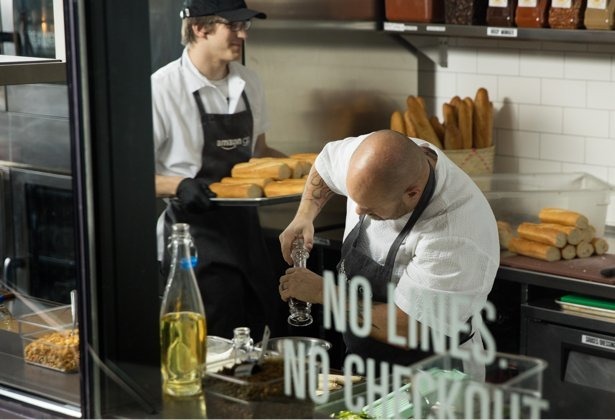 On Tuesday Amazon revealed "Amazon Go," its first-ever grocery store, which is currently open only to Amazon workers but will reach the public in early 2017. Shoppers have to check in with a special app, but can then simply pick up whatever they want and leave, with the bill appearing on their Amazon account. Various sensor and AI technologies are used to determine what a customer is taking off of shelves. Still in the works, the sources said, are two other store formats. Whereas Go is closer to the size of a convenience store, in November Amazon's technology team reportedly approved a proposal to open much larger, multifunction stores with curbside pickup options. With the greenlight, planning and hiring can get underway. Two drive-through prototype stores, without any in-person browsing, are meanwhile expected to open in Seattle within the next few weeks. Amazon is already a dominant force in selling products like books and electronics, but it has made little headway into groceries, which are delivered via AmazonFresh or Prime Now. The extra cost and wait times can make those options impractical even where they're available, but physical outlets might solve both problems.